Philadelphia Eagles center Jason Kelce rides in the Super Bowl championship parade down Broad Street. His speech at the Museum of Art stirred fans. Mike Francesa, a now-retired radio host still making radio appearances, is known for many things from his long tenure at WFAN in New York; being utterly confused about soccer, being angry about soccer, being angry about college football timeouts and being baffled about the idea of a female coach in a male sports league are among them. Mostly, though, he's known for getting very, very angry. 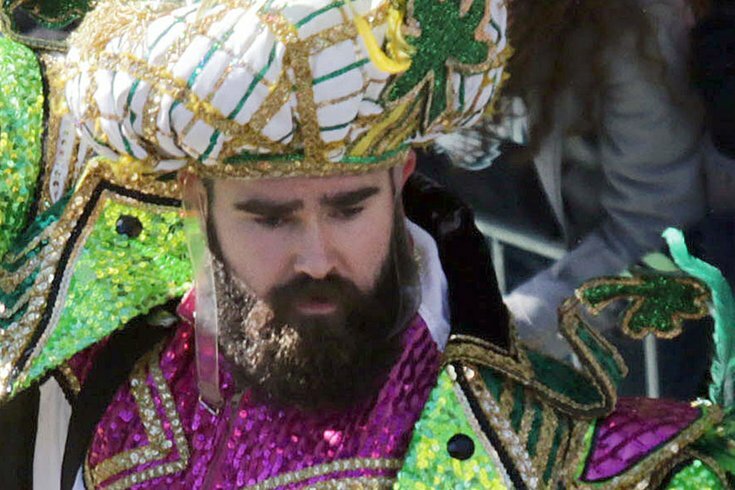 All of which is to say I'm not shocked about Francesa getting incredibly irritated at Jason Kelce's epic but NSFW Super Bowl parade speech last Thursday. And as one of the original masters of hot takery, he has a take about Kelce so scorching you could fry an egg on it. Should of stayed home, the jerk. Why is it that I have to be in my car when these guys win championships and they decide they are going to grace the audience with this profanity-laced stupidity? You got to turn it off, your kids can't even listen to it. He sounded like a total moron. How about going up there and being a champion and acting like a champion and not acting like a total moron? I turn that stuff off, I've seen LeBron James do that, now I've seen him do that. You know what? It's not the time or place. You ever here about winning like a champion? It was embarrassing. Somebody should have taken a hook and pulled him off. I turned it off. I was in the car and I heard it, and people were replaying it like it was the greatest thing in the world. How dumb are you to replay that? I mean I wouldn't give that one second air time. It's embarrassing. That's not the place or the time to do that, you got people who take — you got kids who take off from school, you got families who, you know this is a life experience for them to be in a Super Bowl parade for a city, and you go up there and go onto a 15-minute, profanity-laced tirade? (Author's note: For some reason, Francesca pronounces "tirade" as "Tyrod," like Tyrod Taylor.) It's ridiculous. Nobody wants to hear that. If I were the owner of the team, I'd cut him. • For someone who recently retired, Francesa sure loves to still frequent the airwaves to opine about sports. • THINK OF THE CHILDREN!! • He sort of compared Jason Kelce to LeBron James. So, congrats Jason, I suppose. • As our Eagles writer Jimmy Kempski pointed out, despite Francesa's suggestion, there's no way Kelce is getting cut. • Lol, you mad bro?